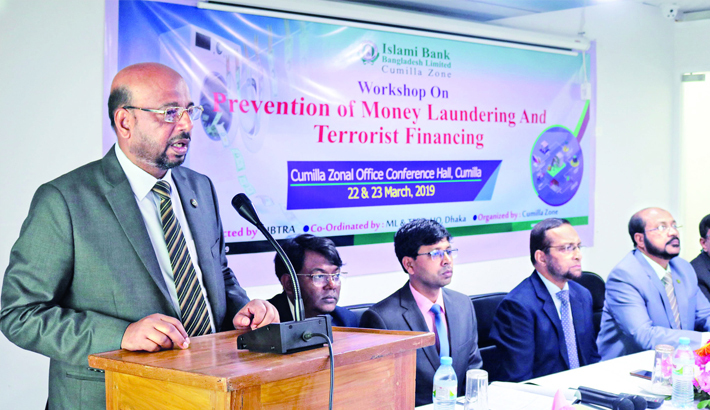 Islami Bank Bangladesh Deputy Managing Director Abu Reza Md Yeahia speaks at a workshop on ‘Prevention of Money Laundering and Terrorist Financing’ at Cumilla zone office of the bank in Cumilla recently. Islami Bank Bangladesh Limited organised a workshop on ‘Prevention of Money Laundering and Terrorist Financing’ at Cumilla zone office of the bank recently. Abu Reza Md Yeahia, Deputy Managing Director of the bank addressed the workshop as the chief guest, said a press release. Presided over by Md. Mosharraf Hossain, Executive Vice-President and Head of Cumilla Zone, Md. Saleh Iqbal, Senior Executive Vice President, Mahmudur Rahman, Head of Noakhali Zone, Md. Jashim Uddin and Md. Abul Khayer, Vice Presidents of the Bank also addressed the programme among others. The workshop included several sessions on the duties and responsibilities of Branches to prevent money laundering and terrorist financing.